A few nights ago, I decided to make muffins. I’ve been in a bit of an experimental mood lately, so I’ve been trying all kinds of new recipes from my library of cookbooks. 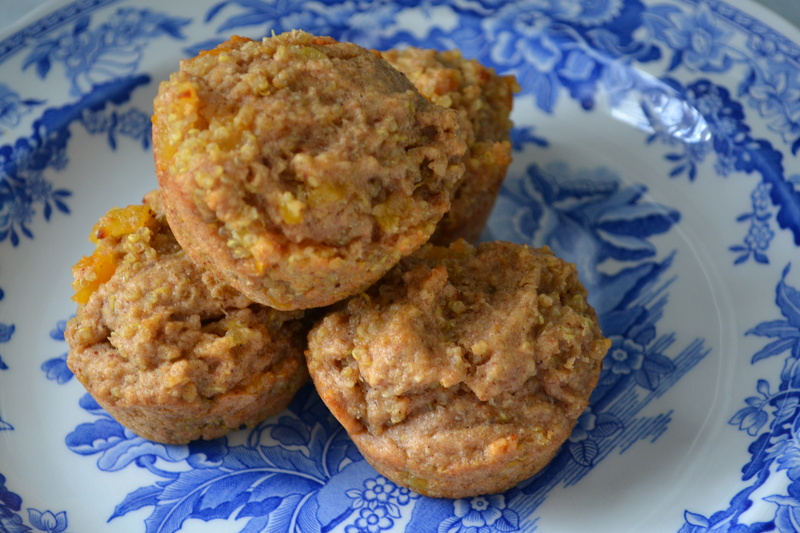 These were the Apricot Almond Quinoa muffins from The Veganomicon, which is great* (and was a gift a few years back from Ricky’s lovely and thoughtful grandmother!). I made muffins, and I also made a rather large mess—which, given the diminutive scale of my kitchen, doesn’t take much more than a spoon left out of place. That artificial light really isn’t doing my hideous counter and hideous tiles any favors. 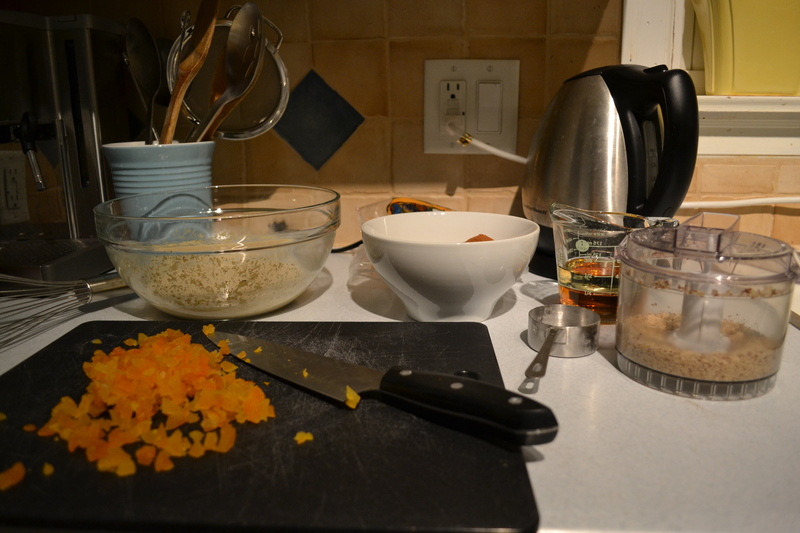 It’s pretty hard to get organized for a semi-complicated recipe on my very small counters: mixing things, grinding almonds, chopping apricots. Someday, I will have more counter space because someday, the microwave will not be hulking itself all over the place on a chopped-off-mismatched-and-not-level piece of laminate. Some other day, I will live in a house with a less infuriating kitchen. The temptation is just to eat take-out and/or cry (and I do a little of each). Given that I like to cook as much as I do, it’s something of a miracle that I’ve learned to tolerate this setup as well as I have—I’ve turned out all kinds of pies and complicated dishes through a series of juggling acts. Really, it’s pretty scary to pull two half-sheet pans out of a 500 degree oven and then try to figure out what to do with them next. It usually involves me frantically shouting at Ricky and/or the cats to back up or risk singed hair/whiskers. But I digress. I created the ugliest, most cramped mise en place ever, followed by the worst quinoa-boil-over ever. Ugh. Obviously, this is a post-panic picture, after I’d wiped up most of the liquid and scraped the ruined quinoa into a heap. I’m still finding quinoa in every crevice of the kitchen. In the end, the muffins were pretty enough—especially since I waited until the morning to photograph them (again, that nighttime light is really awful). Turns out, the muffins not only looked better in the morning—they tasted better, too, after spending the night in the refrigerator. I had one for a snack today, with a banana and some iced coffee. I’m so glad it’s finally warm enough for me to contemplate iced coffee again. I liked the flavor of these, and the quinoa adds an interesting dimension. I really like the chopped dried apricots and cardamom. The texture was a little off-putting at first; when warm, they were a bit too much like a quinoa-cake and not at all like a pastry. They settled into something more densely bread-like by morning, but then I saw a fix for the recipe that suggested adding in some baking soda. I’ll make these again, and I’ll try that. I will also try not to flood my stove with an ocean of soupy quinoa. Sometimes, I wish I’d gotten a gas stove. I’m pretty happy with the smooth surface, as imperfect as it may be. 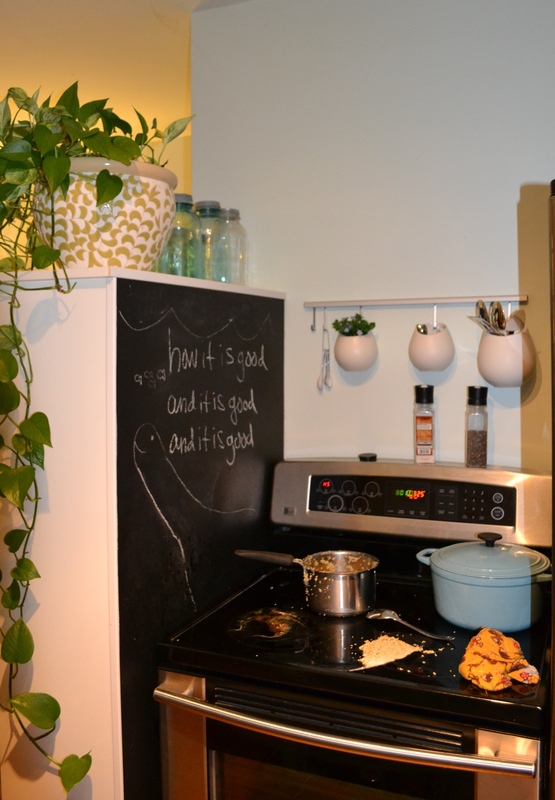 Living with imperfection, after all, is the story of home-ownership. And also of these muffins. *I’ve liked every recipe I’ve made from the book except the spaghetti and beanballs. Maybe it was user error, but they were a mess. OMG are those muffins as freaking amazing as they look or does your camera just make everything look delicious? Maybe test this hypothesis out and take a picture of Puck?